23 Christmas Hits for Karaoke including Merry Christmas Everyone (Shakin' Stevens), Santa Claus Is Coming To Town, Please Come Home For Christmas (Bon Jovi). 15 Traditional Christmas Carols for Karaoke including Hark! The Herald Angel Sing, Joy To The World, O Come All Ye Faithful, Silent Night plus much more! 14 Favourite Traditional Christmas Karaoke Tracks including Let It Snow! Let It Snow! Let It Snow!, It's Beginning To Look A Lot Like Christmas, We Wish You A Merry Christmas and Please Come Home For Christmas. ONLY 2 CDG PACKS LEFT IN STOCK! 20 Karaoke Tracks of Christmas Favourites including All I Want For Christmas Is You (Mariah Carey), Last Christmas (Wham! ), Blue Christmas (Elvis Presley) and traditional classics including Jingle Bells, Silent Night and Let It Snow! Let It Snow! Let It Snow! This album is available to download in MP3+G & MP4 format or purchase on CDG disc. If purchased on CDG disc this album will not have the same artwork as featured and will be sent in a standard Sunfly sleeve. This USB audio recorder can record audio from nearly any source and play it back or store it for transfer to a computer. 1GB storage. Also functions as an MP3 Player. 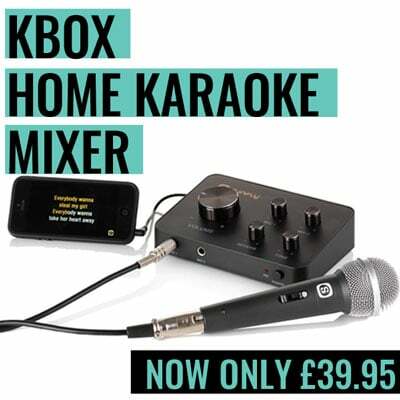 Great value, heavy duty, low noise corded karaoke microphone designed for clear and accurate vocal reproduction. 4 metre cable.